Happy end of November everyone! I had a nice little message from Ingrid of 3 B's today asking how things were going, so I thought it was time to update a little. Truth be told, I look back at November and think, once! That's it? I posted only one recipe? How is that possible? Well, then I started to think about November and go "oh yeah, that's what happened to it" and December isn't likely to produce much more looking ahead. I started off November sick. Although completely unconfimed I have suspicions that I had H1N1. The symptoms were there, fever, cough, sore throat, lack of energy - never mind working at 2 schools where there were confirmed cases and lots and lots of sick students and staff. So I had very little energy for about two weeks there. (I did recieve the vaccine, but the symptoms showed up before the 10 waiting days were over). I recovered nicely in time for my birthday. I had a lovely, lovely dinner out with my husband and a few close friends. We went to Suwanna, which is my favorite restaurant in town. It is a Thai restaurant and luckily my friends think like we do, order 6 dishes and pass around to share. We had Pad Thai (of coure, 2 orders of it), Matsaman Curry (my pick, so delicious), Bamboo Shoots (tres spicy! ), a beef stir fry (yummy) and I know there was one more dish, I'm just not remembering what it was now. We also had some Thai carrot/cabbage salad, which is so delicious and curry puffs as an appetizer. I'm going to miss this restaurant when we move away. I did take pictures of the evening, unfortunately, my photo card got accidentally erased before we downloaded anything. The next part of the month has been dedicated to work, work and more work. Pretty much from Thanksgiving on till Christmas, my job kicks it up a notch (Canadian Thanksgiving - 2nd Monday in October). I teach music so I'm involved in getting performance groups ready for Remembrance Day ceremonies (Nov. 11th), the Empty Stocking Fund telecast (last weekend-a 70+ year old local telethon benefitting families that need help at Christmas time), the Santa Claus Parade (very strange to sit on a float, you can't believe the number of people that watch that thing! ), and currently Christmas Concerts. As I said I work at 2 schools, so most of this is x2 work. Never mind that report cards fall into the middle of all this and parent teacher interviews (marks for 600 kids). So yes, work has kept me busy. And through all this I've found myself right into my 3rd trimester. Yay! Of course 3rd trimester means less energy and I've definately seen myself slowing down a bit. I've started to teach sitting on a chair, instead of sitting on the floor with the kids. I also discovered that there are certain songs I cannot participate in with the kids. I had to laugh at myself when I was teaching this one song to kindergarten classes that involves getting down on all 4's and then jumping up and jumping up and down - I couldn't do it. Talk about changing your lesson plan on the fly! (I teach 4 kindergarten classes in a row, so that just wasn't going to work!). My own little guys are doing well. They and my husband take up the rest of my energy really. I have done more cooking this month than my blogging shows for, but my pregnant brain often fails to remember to take a picture. So here's a doozy of a blog post for you all. One of my favorite comfort meals of fall and winter, a pot roast beef dinner. Oh it is so yummy, I want to make it again right now. 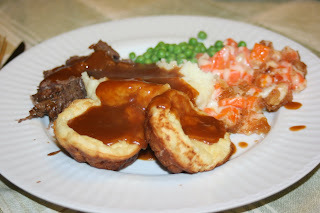 This dinner had the beef, gravy, yorkshire pudding (my Auntie Sue's Recipe), whipped potatoes, peas and a carrot bake (Katy's recipe of Food for a Hungry Soul). I like to cook my roasts in a crock pot, it just makes the meat so tender. I put this all on in the morning and let it cook for 8-10 hours. Prepare your crock pot by spraying with non-stick cooking spray. Sprinkle roast lightly on all sides with salt, pepper and flour. Heat oil in a frying pan (med-high heat). Add roast and brown on all sides. Once it is browned/seared, place roast into the crock pot. Mix remaining ingredients together. Pour over roast. Cover, put crock pot on low heat and cook for 8-10 hours. (You can also make this on high heat for 4-5 hours). Once roast is finished, remove it from the crock pot and cover with foil to keep hot. Drain the juices over a seive and into a saucepan. Add 1 cup water, 1 tbsp beef boullion powder and 1/4 cup + flour. Whisk everything together over med. heat, whisking constantly until gravy is heated thouroughly and thickens. My Auntie Sue is one of my very favorite people. She isn't really my aunt, but a good family friend that I've known my whole life. I grew up with her home being my second home and our families spending a lot of Sunday dinners and Holidays together. She is a wonderful cook. I'm glad my mom snagged this recipe of hers for me. Whisk eggs. Add rest of ingredients and whisk together. Spray a muffin tin with non-stick cooking spray. Bake at 425* until done (about 10 minutes or so) - the puddings should puff up nicely and brown. My mom says this works best if the ingredients are cooled in the fridge while the oven is heating. My English husband insists it works best if you let the ingredients sit at room temperature for 1/2 hour or so before baking. I've done it both ways and both ways turn out well. Happy Belated birthday! Your dinner sounds wonderful. good to see you again! being sick is lousy! this looks just wonderful and so comforting! Boo hiss on being sick. But happy birthday to you! Yum ~ roast beef. I can't seem to get the hang of doing it well. Yours sounds so good and now I'm wanting a nice big portion of it. Love the Yorkies, they are a particular favourite of mine! Hey, Lady! So glad to hear that (for the most part) it's only been a busy life keeping you away and here I thought I was busy. Good luck getting everything done. Happy New Year, my friend! Doing a flutter by to wish you a Happy New Year! Thank you for sharing your delicious recipes this past year and thank you for your friendship. Looking forward to 2010. May the promises and hopes for 2010 come true. Hope all is well with you and baby! Just checking in.